Medicinal Uses: Rosemary stimulates the central nervous system and circulation making it beneficial for low blood pressure and sluggishness. Rosemary oil and rosemary essential oil are used to alleviate the pain of sprains, arthritis, sciatica and neuralgia. 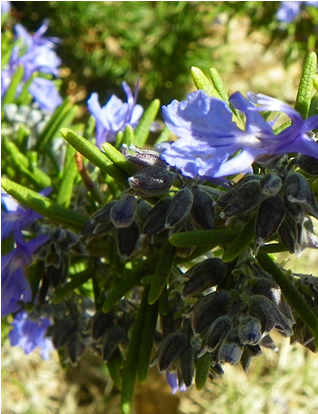 Rosemary has also been used traditionally to ease asthma. “The essential oils in rosemary leaf can block histamine, the chemical culprit of both asthma and allergies. ”(White, Linda. 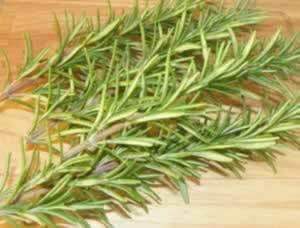 MD) Add rosemary essential oil to your bath or in steam inhalation. Rosemary for memory, concentration and focus. Rosemary has a long herbal tradition as a herb that improves concentration and memory, Greek students would braid Rosemary into their hair to help them with their exams. Modern science attributes much of rosemary's action on the central nervous system to it's potent antioxidant, rosmarinic acid. The uplifting aroma of a fresh sprig of rosemary in the summer air will confirm both the science and history with your own senses. Rosemary for beautiful skin and hair: Rosemary is one of best hair tonics available, whether you are worried about hair loss, or just want healthy, happy hair, rosemary extracts used in shampoos and herbal hair rinses will work wonders. A few drops of the essential oil can be applied directly to the scalp or hair brush to restore dry, flyaway hair and make it shine. Rosemary essential oil stimulates hair follicles and circulation in the scalp, which may help prevent premature baldness. Use rosemary on a continuing basis for a healthy scalp that encourages healthy hair growth and slows hair loss. Hoffmann, David Rosemary extract (rosmarinic acid) is a natural way to stabilize and extend the shelf life of hand made cosmetics, creams, lotions, and other herbal compounds. Use rosemary in skin care to tone and soften skin. How to Use Rosemary Oil The Commission E approved the internal use of rosemary leaf for dyspeptic complaints and external use as supportive therapy for rheumatic diseases and circulatory problems. Commission E MonographsRosemary infused oil and rosemary essential oil are both used in massage oil formulations to relieve the pain of arthritis and of sore aching muscles. Rosemary used as a massage oil also helps to tone the circulatory system. Antioxidant compounds in rosemary prevent uterine spasms and menstrual cramps. 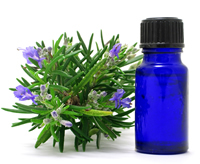 Rosemary essential oil helps alleviate water retention and increases circulation when used in massage blends. Cooking with Rosemary. Unlike milder herbs, rosemary can withstand longer cooking times, and lends itself well to roasted meats, chicken and hearty stews. A few teaspoons of chopped rosemary lends a tangy taste to biscuits as well. Rosemary vinegars are an excellent and healthy way to dress cold vegetables and salads. Rosemary is such an extremely useful herb, with so many culinary, medicinal and aromatherapy attributes that it deserves a treasured place in your home. Even the twigs, stripped of their leaves find use as kindling and as a aromatic addition to barbecue fires. Preparation Methods & Dosage :I use this amazing herb in some form almost every day. A few drops of rosemary essential oil on my hairbrush, rosemary vinegar on my salad, rosemary infused oil to massage my sore shoulders after digging in the garden - the fresh, uplifting scent of rosemary is a constant friend. Early in the day, before the hot afternoon sun releases the resin volatile oil from the leaves, you may want to pinch some fresh sprigs and make some rosemary vinegar for your salad. Chop some up and add to biscuits, quick breads, or roast chicken. Make sure to pick enough to make a strong rosemary tea for a hair rinse, or to start another batch of rosemary infused oil. Use rosemary oil in cooking, or as a massage oil to soothe aches and pains. Rosemary has a camphorous, piny aroma that lifts your mood and clears 'brain fog'. Rosemary oil is one of the top essential oils to combat mental fatigue, and keeps you alert during long hours of study or work, increasing concentration and memory. For morning sluggishness try a brisk rosemary rubdown in the shower. Add 2 to 3 drops to a washcloth along with shower gel and massage over the body. Rosemary Side Effects: Do not use in excessive dosage. Avoid in cases of epilepsy. Rosemary originated in the Mediterranean, and now is grown worldwide. The plant is shrublike and bushy with small, blue flowers, the whole plant is strongly aromatic. 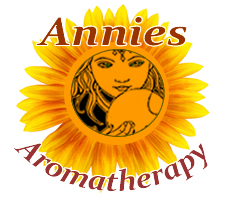 The essential oil is distilled from the fresh flowering tops and the upper part of the herb. Rosemary is very difficult to grow from seed, your best bet is getting a starter plant from the nursery. There are different cultivars to choose from, differences mainly in flower color and growth habits. All are wonderful, perennial bushy plants that provide green, resinous leaves to cook and heal with. Rosemary is a native of southern Europe. It was brought to America by the first colonists, and stored carefully indoors during the cold winters. This amazing, versatile herb is cultivated worldwide, and valued by cooks, herbalists, aromatherapists, and gardeners alike. Greek students would braid Rosemary into their hair to help them with their exams. Also known as the herb of remembrance, it was placed on the graves of English heroes. Hoffmann, David . "Medical Herbalism: The Science and Practice of Herbal Medicine" Healing Arts Press, (2010-12-15) Rosemary acts as a stimulant to both hair follicles and circulation in the scalp, and thus may be useful for treating premature baldness. Rosemary essential oil is most effective for this purpose. Linda B. White, M.D.. "The Herbal Drugstore" Rodale, (2003) This common culinary herb has been used traditionally to ease asthma. Rosemary's essential oils can block the airway constriction induced by histamine, the chemical culprit of both asthma and allergies.